​Dains Custom Athletic Lockers proudly offers a variety of athletic locker accessories and locker room furniture options to further enhance the look, feel and function of your high school, college and community locker rooms. These offerings include high quality football shoulder pad and helmet racks, padded locker room seats, whiteboard cabinets and more. 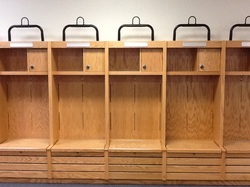 ​The DCAL Should Pad / Helmet Racks are arguably the most sought out items for locker rooms across the country. Our unique shoulder pad storage design provides maximum ventilation and makes storing your pads and helmet easy! The rack is most commonly attached to wood athletic lockers, but you can attach it to almost any style locker! 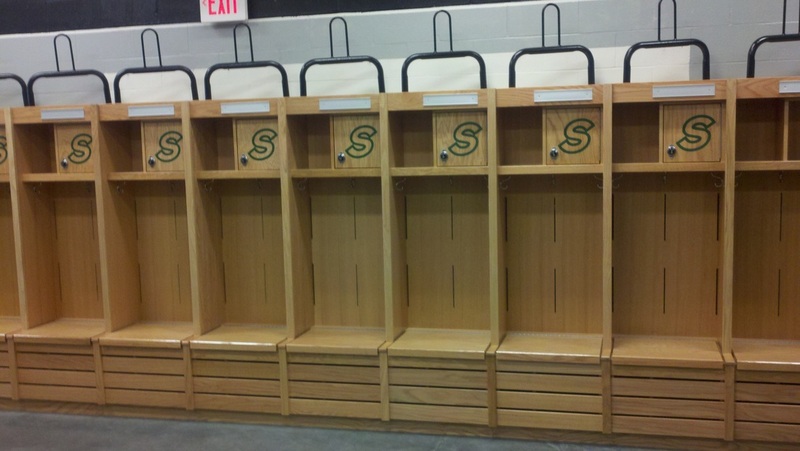 If you're looking to add a splash of customization to your current lockers, then a custom padded seat is the way to go! We can manufacturer 2" thick, marine grade vinyl padded seats to fit your locker benches. The removable velcro bottom makes installation a breeze for any school. 1. TV's up to 47"
2. TV's up to 65"
3. TV's up to 80"